The four composers, whose works are presented on this CD, were all born within a 33-year period in the second half of the 19th century and lived on in some cases well into the 20th century. Following different paths, they succeeded in breaking away from their late Romantic roots and developed individual styles. 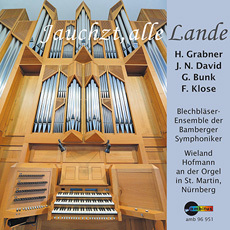 The strong impression made by German organ music as embodied in particular by Max Reger and the Leipzig School is made as clearly apparent here as the lasting influence Anton Bruckner had on both organ and church music. Hermann Grabner (1886-1969) is mostly known today for his music theory textbooks; his large compositional output on the other hand has all but fallen into oblivion. Grabner managed to completely free himself from the compositional style of his teacher. His organ works were composed specifically according to the precepts of the Organ Reform Movement (Ger. : Orgelbewegung). These compositions, dressed in old-fashioned forms, are characterized by plain modal harmonies and clear counterpoint, in compliance with the Neo-baroque ideal of organ-building. The German-Austrian composer Johann Nepomuk David (1895-1977) ranks among the most important and prolific 20th century organ composers. David developed his own unique style, which is distinctly contrapuntal in design. As a result, his handling of themes is uncompromising, giving rise to an often austere-sounding harmonic fabric. His compositions are often modeled around musical forms of the past (toccata, chaconne, prelude, ricercar, etc.). His early, freely-composed organ works, such as the Chaconne in A minor or the Toccata and Fugue in F minor, are still very much influenced by Max Reger and especially Anton Bruckner. The monumental Opus Introitus, Chorale and Fugue from 1939 for nine brass instruments and organ is based on a theme that Bruckner sketched out for a concert in Kremsmünster on 21st August 1884. Despite, or rather because of his strict contrapuntal style, which shows no consideration for harmonic harshness, David is able to create a work of utmost urgency and emotionality. Gerard Bunk (1888-1958) was one of the great organists of the second half of the 20th century. He was held in high esteem by several famous contemporaries, such as Charles-Marie Widor, Karl Straube, Max Reger, Sigfrid Karg-Elert and Albert Schweitzer. Written in a late Romantic style, his Legende (‘Legend’) was his first large-scaled work for the organ, appeared in 1908. In this piece, which is ideally and effectively set for the organ, Bunk speaks in his own independent musical language, which, at the time of Reger, was certainly not a matter of course in Germany. His harmonic treatment is reminiscent of César Franck’s; Lisztian echos are unmistakably heard as well, especially in the recitative-like beginning of the middle section. The Präludium und Doppelfuge über ein Thema von Anton Bruckner für Orgel und acht Blechbläser im Schlusschoral (‘Prelude and Double Fugue on a Theme by Anton Bruckner for Organ and Eight Brass Instruments in the Concluding Chorale’), written in 1907, is the only work for organ by Friedrich Klose (1862-1942). In fact, his entire oeuvre remained rather limited. Klose’s ‘Fantasia-Chorale’ and Bruckner’s improvisation theme are the main themes throughout both the Prelude and the Fugue. The ‘Chorale’, played along at the end by the brass in a hymn-like finale is introduced first in the Prelude just after Bruckner’s theme, in a rhapsodic way, as if coming down from a mystical sphere. In the Fugue, Bruckner’s theme is at first rearranged in skillful counterpoint, then combined with the Chorale theme, which is used for the fugue’s second subject.